Thirty wooden beads in six vibrant colors and five distinct shapes combine with two extra-long laces for many activities. Stringing the easily grasped beads promotes hand-eye coordination fine motor cognitive and visual perception skills. 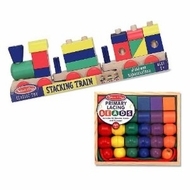 Wheeled train cars provide the bases for this wooden stacking train. Featuring fifteen colorful pieces that slide onto sturdy pegs the train can be configured over and over again. More than seventeen inches long when the cars are hooked together!